Last week we reviewed Y browser , free file browser for Nokia . 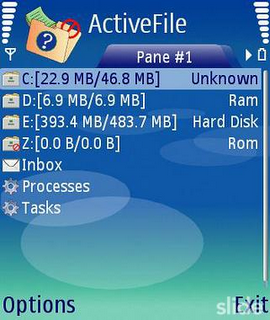 Active file is another free file browser/explorer for Symbain Nokia S60 V3 and S60 V2 devices . Unlike other file explorer softwares ,Active file has some other functions like screenshot capture ,SMS backup , system monitor etc. Download Active file free File browser for Nokia . Browse through internal files/disks of Symbain Nokia and SonyEricsson phones. Take screenshots and save them as PNG,JPEG images . Collect various System hardware informations . Send files over Bluetooth ,WiFi and infrared . Create fake SMS messages . Backup contacts and SMS . View running internal process and kill the required ones . Download Activefile for S60V3 Symbain . Download Activefile free File explorer for Nokia . Download Activefile free File browser for Nokia .